Seagate Technology (NASDAQ: STX) continued its momentum from the last quarter results reporting solid Q2 results amidst weak macros facing the memory market. The data storage provider’s second-quarter results were mainly driven by reduced expenses due to the operational efficiency initiatives taken by the firm. 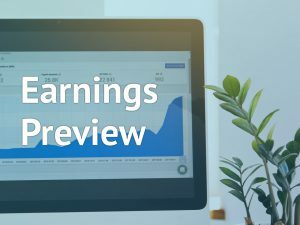 The company reported adjusted earnings of $1.41 per share, which surpassed $1.28 per share expected by the analysts. Revenue of $2.71 billion came in a tad below $2.72 billion forecasted by the street. Shares of the firm were trading above 3% in the after-market trading hours post the solid Q2 results. Seagate’s board has declared a quarterly dividend of $0.63 per share. The company has set the payable date as April 3 and record date as March 20. Last year for the same period, the data storage provider reported earnings of $1.48 per share and sales of $2.91 billion. Seagate had earlier guided Q2 revenues to be in the range of $2.7 billion to $2.75 billion and gross margins to be at the low end of its 29% to 33% long-term range. Last quarter, the company’s sales rose about 14% to $2.99 billion, aided by a 41% growth in Exabyte shipments. The top line surpassed market expectations. Average capacity per drive rose to a two-year high of 2.5 TB. Seagate’s rival Western Digital (WDC) reported weaker-than-expected Q2 results last month. The company was hurt by volatile NAND flash pricing coupled with weaker demand, rising inventory levels, and ongoing trade wars pulling down the average selling prices. Free cash flow dropped sharply by 96% over last year, which remains a concern for investors. The long-term debt for Seagate at the end of Q2 stood at $6.85 billion compared to $7.74 billion reported last year. Despite the reduction in debt, investors would be concerned about the debt level due to the weak macros and currency-related impacts impacting the firm resulting in a delay in paying back debts. Free cash flow dwindled 79% to $161 million due to a sharp decrease in operating cash flow. Seagate and its peers had been facing the brunt of the cyclical nature of the digital memory business. It has been a tough period for memory storage firms last year due to weak demand for memory products resulting in over-supply of products and rising inventories pulling down margins for Seagate and its rivals. The ongoing trade war between the US and China had made things even tougher for the industry. 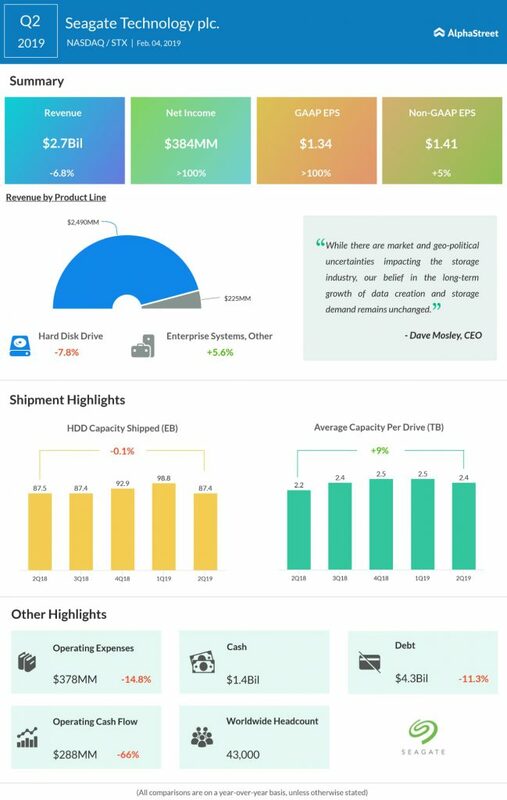 NAND-flash memory market has been hurt badly by the bear market with dwindling NAND flash prices which has impacted firms like Western Digital, which gets most of its revenues from NAND memory related offerings. Unlike Western Digital, Seagate still gets lion’s share of topline contribution from its HDD offerings, which reduces pressure on margins. Still, with tough macros and the broadening its base into NAND-based products, the company might see margin pressure in the near future. It’s worth noting that Seagate’s biggest money spinner has been the HDD it sells to PC OEMs. With global PC shipments declining, the company needs to diversify into other product offerings to reduce its dependency on the PC market. The company has made its foray into enterprise and data center market to offer HDD to offset the decline from the PC side. Another promising area of growth for Seagate would be offering memory storage via the cloud. With the increasing awareness and adoption of new-age technologies like artificial intelligence, machine learnings, big data analysis by enterprises, cloud solutions would act as a tailwind. NetApp (NTAP) with its cloud-based offerings hasn’t faced the brunt of the bear market much unlike its peers despite the volatile nature of the memory industry. Seagate has been investing in the enterprise and cloud-storage market to tap into the growing demand from its clients. It recently launched many products catering to these markets in CES this year, which would help the firm to compete with its rivals and diversify from the legacy PC-based HDD market.